Connecting Boomers, Seniors, and Caregivers with Local Resources and Services to Live Vibrantly! An exciting array of services and resources for seniors to live independently or with assistance in Hudson and St. Croix County. At the first annual Hudson Senior Expo, you’ll find service providers and resources in our Hudson community that focus on helping seniors age in place in the family home, or transition to senior housing. Hear four (4) presentations on a variety of topics important to Hudson’s senior community and meet one on one with representatives from senior housing, healthcare and wellness providers, finance and estate planning, real estate and moving professionals, and more! THE FIRST 100 PEOPLE TO PRE-REGISTER WILL RECEIVE A FREE LUNCH AND BE ENTERED FOR DOOR PRIZE DRAWINGS! This is a FREE event. We encourage you to pre-register. Register online or register by phone by calling John Durham at (651) 231-2191. Becky and John Durham, Realtor/Broker, RE/MAX Results (Licensed in WI & MN) – Evaluate options for aging in place & cost saving calculations when ‘Rightsizing’ your Home to Finance your Ideal Retirement Lifestyle and Long Term Care Needs as You Age. Brad Beckman, Director, Aging and Disability Resource Center of St. Croix County – Issues facing St. Croix County seniors as they age in place, and available resources through the Age & Disability Resource Center. Katie Kranz,Attorney, Eckberg Lammers Attorneys at Law – Estate planning for seniors, including wills, trusts, power of attorney, and more. Mike Kojonen,Owner, Principal Preservation Services – There is more to Social Security than income. . .TAXES! 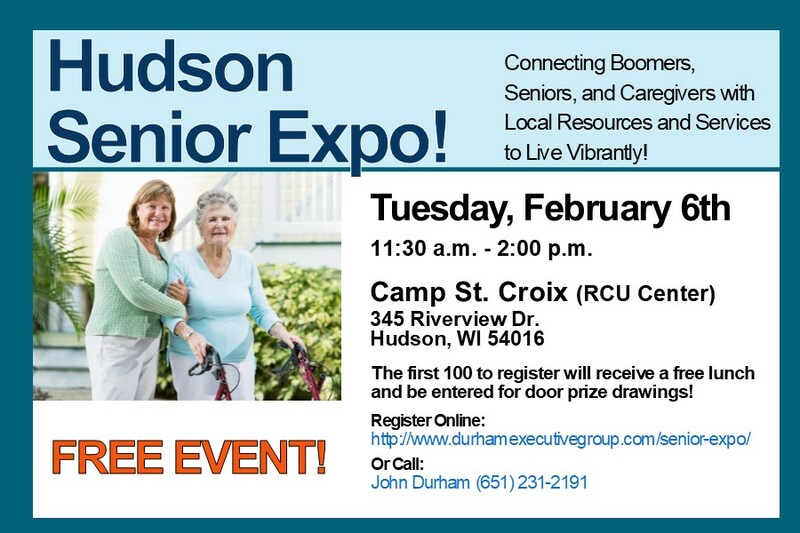 We invite all businesses and non-profits that serve the senior and 55+ community in St. Croix County to become exhibitors at the Hudson Senior Expo!